Hey everyone! Hope you're having a fabulous Friday and are ready for a new Pawsome Pet of the Week! This week, we'll do things a little differently. I admittedly don't have an exclusive interview for you today, but don't worry - this week's Pawsome Pet is still worthy of the title! 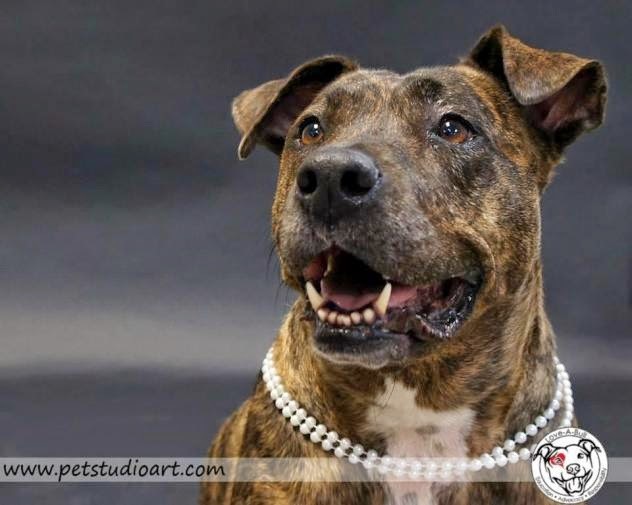 Our Pawsome Pet of the Week is named Truffle, and she's an American Staffordshire Terrier living in Austin, TX. Truffle is very well-behaved but there's just one problem... she needs a forever home. She's currently looking for her new home with Love-A-Bull. 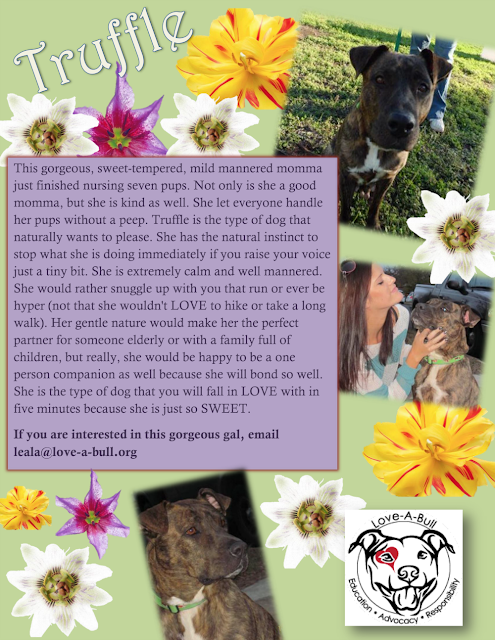 Here's a flyer that will tell you just how pawsome Miss Truffle is. See what I mean - doesn't she sound like an amazing dog? You can view Truffle's Petfinder page here for more information about her. You can help Truffle to find a new home by sharing! Be sure to stop by next Friday for a new Pawsome Pet of the Week! Truffle sure is pretty and she has the sweetest face! Aw she sure is beautiful! Sharing! She's beautiful. I hope she finds a home soon! Hmmm... well, not sure why! Mine have been coming through OK. I'll look into it, thanks for the heads up! Truffle looks like such a big sweetie! I just love brindle colored dogss. We have shared her and hope she finds a home soon. I'm so digging the slammed up look with the pearls. Paws crossed that forever home comes quickly. She sounds like the perfect dog. Any family will be lucky to have her.